U.P Rajya Vidyut Utpadan Nigam Ltd invites Online Applications from BE/BTech passouts in Electrical/ Mechanical/ Telecommunication/ Instrumentation/ Electronics and Instrumentation/ Electronics/ Industrial/ Industrial and Productiom or Civil Engineering for the current openings. Posted in Apply online, Civil, Electrical, Electrical & Power, Electrical and Electronics, Electronics and Communication, Electronics and Instrumentation, Electronics and Telecommunication, Freshers, Government Job, Job After Btech, Mechanical, Without Experience. 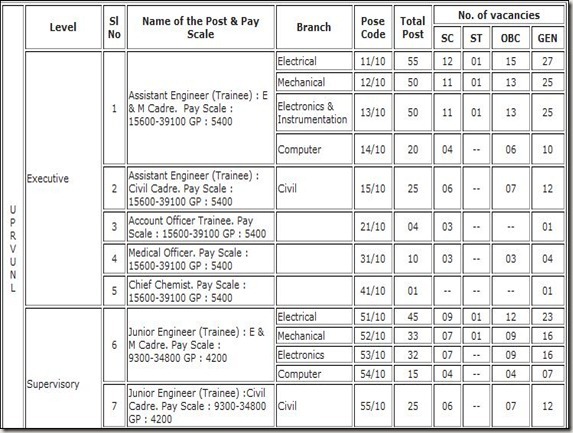 Tags: Apply online, Assistant Engineers Hiring, BE/Btech hiring, February 2014, U.P Rajya Vidyut Utpadan Nigam Ltd, UPRVUNL on February 3, 2014 by Lalit Joshi. Posted in Apply online, Civil, Computer Science, Electrical and Electronics, Electronics and Communication, Electronics and Instrumentation, Electronics and Telecommunication, Government Job, Industrial, Instrumentation, Job After Btech, Mechanical, Production. Tags: BE, btech, Civil Engineering, Computer, Electrical & Electronics, Government Jobs, Industrial and Production, May 2010, May-June 2010, Mechanical, UPRVUNL, Uttar Pradesh Rajya Vidyut Utpadan Nigam Limited on May 11, 2010 by kavita joshi. UP Rajya Vidyut Utpadan Nigam Ltd. is an Undertaking of U.P. Government, and is recruiting BE/Btech pass outs as Trainees (Asst Engineer/ Jr Engineer/ Asst ). Posted in Civil, Computer Science, Electrical, Electronics and Instrumentation, Freshers, Government Job, Mechanical. Tags: Apply online, Assistant Engineers, Government Job, Junior Engineers recruitment, March 2010., Public sector job opening, UP Rajya Vidyut Utpadan Nigam Ltd, UPRVUNL on March 15, 2010 by Lalit Joshi.